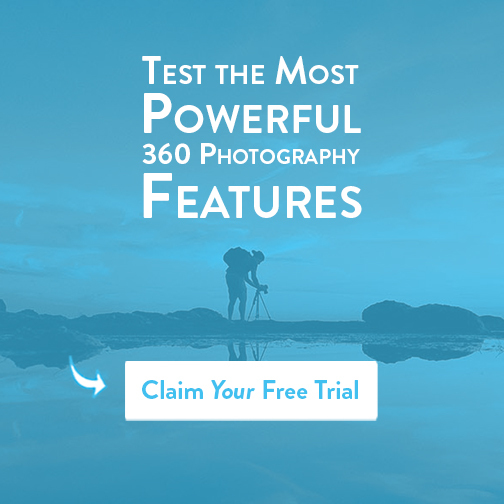 There are many ways to add your own custom touches to your 360 images in SeekBeak. One of the most important customization features we offer is complete control of your branding options within a 360 photo or virtual tour. Keep reading to learn about your many branding options. One of the easiest ways to leave your visual mark on your 360 photos is by changing the colours of your Hotspots. In the example below, I’ve changed my hotspots to have a white background and my text and icons to be blue which matches the SeekBeak logo. Clicking the “Save As Default” button will save these colour preferences for all future Hotspots you create in your team’s account. You can create as many different hotspot colour variations within a Snap as you see fit. For more information and pricing for this feature, check out the pricing page here. Users who are not on the free plan can remove the “Powered By SeekBeak” Icon in the bottom left corner of each image. They can also replace it with their very own Custom Branding options or no Brand at all. You have quite a bit of control of how your branding will look and where it links too. Each Snap you upload can have it’s own custom branding, allowing for you to customize 360 images for a wide variety of clients and companies. Branding settings can be copied to other Snaps as well, set it all up the way you want it in one Snap, then instantly copy all the settings to every other Snap in the Group. 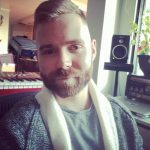 Want to remove that tripod that is at the very bottom of your photo (the nadir)? Want to add some branding or an image for those that look all the way up? That’s what Zenith and Nadir Patches are for. You can access this option in the Snap Preferences. Upload a JPG or PNG file and control the size of it using the distance slider. Our Zeniths and Nadir patches are dynamic. They rotate around with the users view, so they’re always facing up, which means no more struggling to read upside down text. The patches are also non-destructive: unlike Photoshop and other image editors, you’re not ‘burning in’ the patch to your original image. That means less re-compressing of your images, and less hassle if you need to change a client logo or other branding! 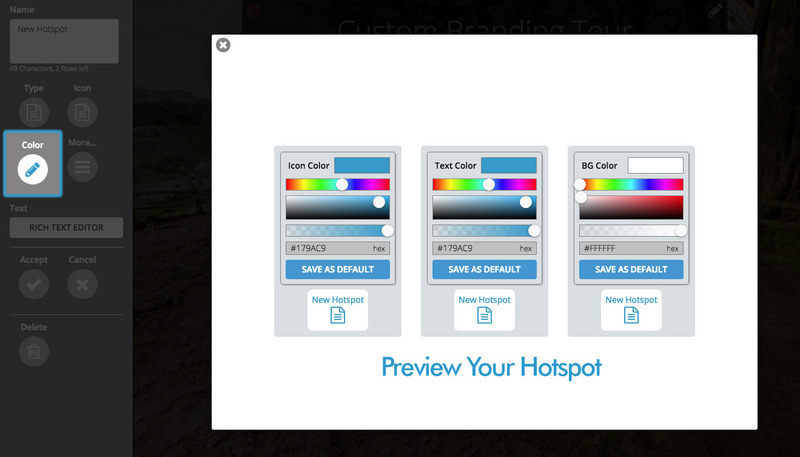 A great way to make your mark on your images is by uploading your own icons for use with your Hotspots. 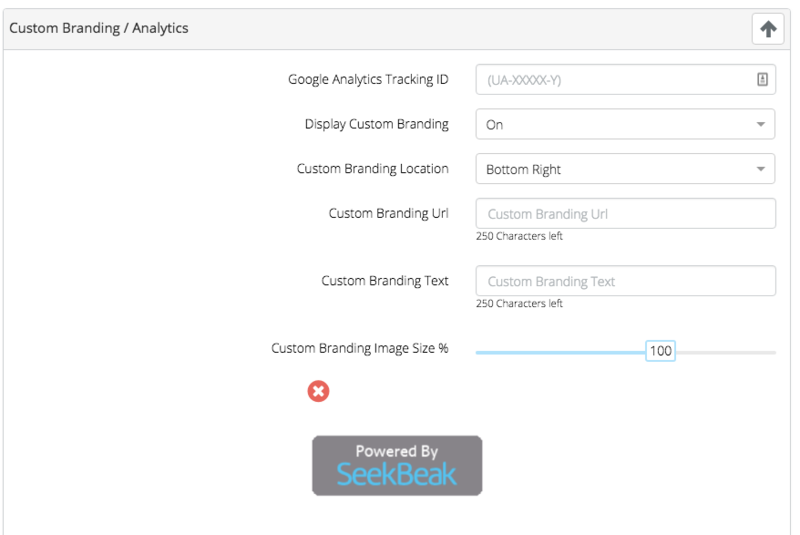 SeekBeak allows you to replace any icon with one that you’ve uploaded or created. The icons need to be in SVG format so that they can scale with any size screen that your image shows up on. You upload the icons via the “User Icon” section of the Dashboard. Many of the branding options are only available to our Pro and Enterprise Plans. To get started with these for free, use the offer below!